What's certainly true about a tiny house is that, by virtue of its size, it brings you closer to nature. Imagine taking that one step further based on how tile inside the house mimics nature. 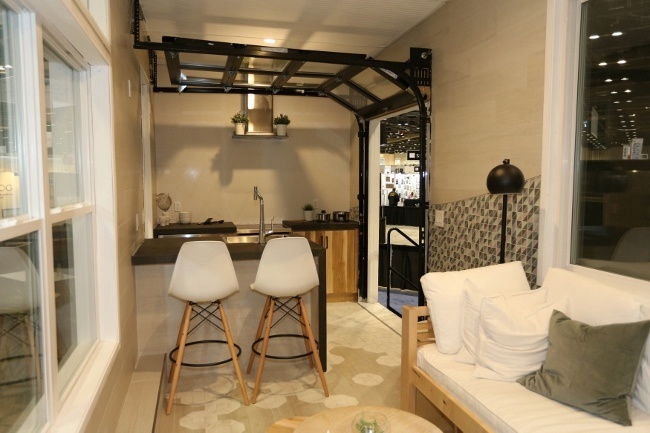 That's what the Vitruvian, a tiled tiny house created during Coverings 2017 in Orlando, captures based on the vision of designer Nikki Vega from BlueTreeHome based in Orlando. She specializes in tiny homes. 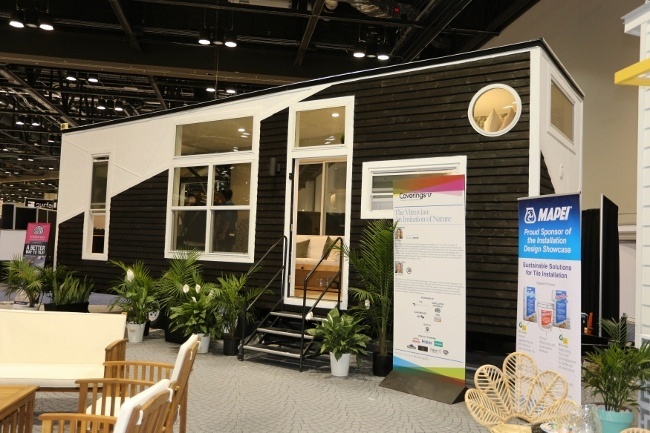 Nikki teamed up with the installation team from J & R Tile, Inc. for the live installation of tile in a tiny house on the Coverings show floor during the annual Installation Design Showcase. “Vitruvius, an ancient architect, believed that architecture and design should essentially be an imitation of the proportion and geometric shapes found in nature. This naturally occurring proportion is known as the Golden Section and can be found everywhere from a flower to a pine cone. Simply looking at the exterior of the Vitruvian, you get the sense that something unexpected is afoot. Notice all of the windows and the interesting siding patterns. Nikki mentions two specific sources of inspiration. Both are nature-based and share the Vitruvian golden proportions (as do us humans!). "That was a huge source of inspiration for how I laid my tile -- the shapes on the wall and the lines." Another shape Nikki pulled inspiration from is the star (you'll notice a starfish in one of the photos below). As you look through the images included in this article, notice the interesting juxtapositions of shapes, forms and textures as well as the arc of the wall mosaic which extends from one end of the tiny home back wall to the other. These are all tile installations that required expertise and deep knowledge of proper tile setting standards and procedures. >> See Tile for Tiny Homes & Small Spaces on the Crossville Tile Blog. Notice the kitchen countertop in the image below. It was made from the Crossville Laminam product, a lightweight thin tile that comes in large sized panels which are ideal for creating this kind of feature. The J&R Tile installation team mitered the edges for a clean finished waterfall effect. 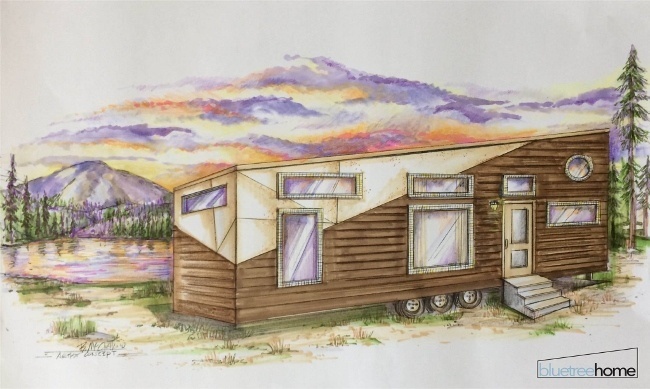 As a tiny home designer, Nikki thinks about the overall weight of the structure. Lightweight tile panels definitely make for a flexible solution. Nikki created a particularly fun transition from kitchen to living space with floor tile. 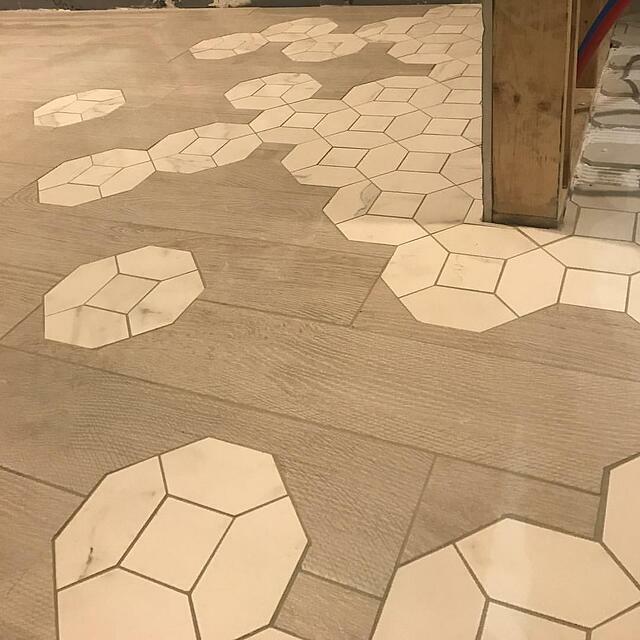 "Going with our geometric concept, we used octagons on the floor to really ground the kitchen space and we did a really fun transition leading into the living area. The octagons slowly transition as they piece together with the plank pieces." The image below captures that slow transition. Notice how the wood planks take the form of the octagons until they completely resolve into planks and the original octagons disappear. In the image below, you see the final result of the kitchen space, with the transitioning floor and the curve of the Groove Glass mosaic wall tile. Nikki particularly liked how perfectly the triangle pieces matched the design concept. 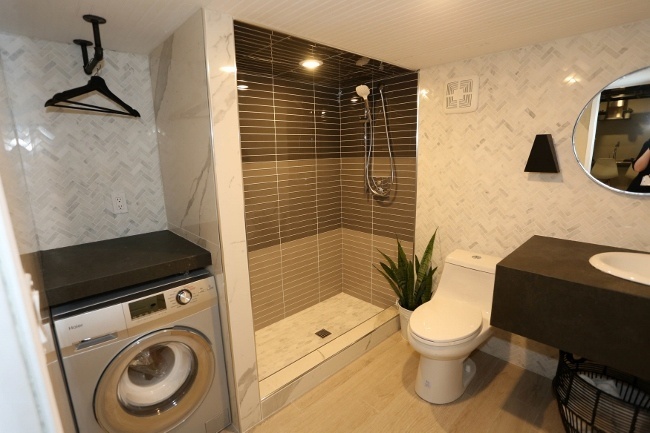 She paired the mosaic with Nest Porcelain Stone, a cool, calm, white grey wood-look porcelain tile, to not overwhelm the space or the mosaic. "It allows the perfect opportunity to have an outdoor cooking space where you put your barbecue and build a little deck, conveniently close to your main kitchen." The bathroom in the tiled Vitruvian Tiny House is surprisingly large and very relaxing-looking. The large shower features Groove Glass in a reverse gradient where it goes dark to light, creating a warm, cave-like feel. On the walls, Nikki opted for a herringbone pattern installation which is popular and fun, too. The space includes a built-in washer-dryer section specifically built for small spaces. 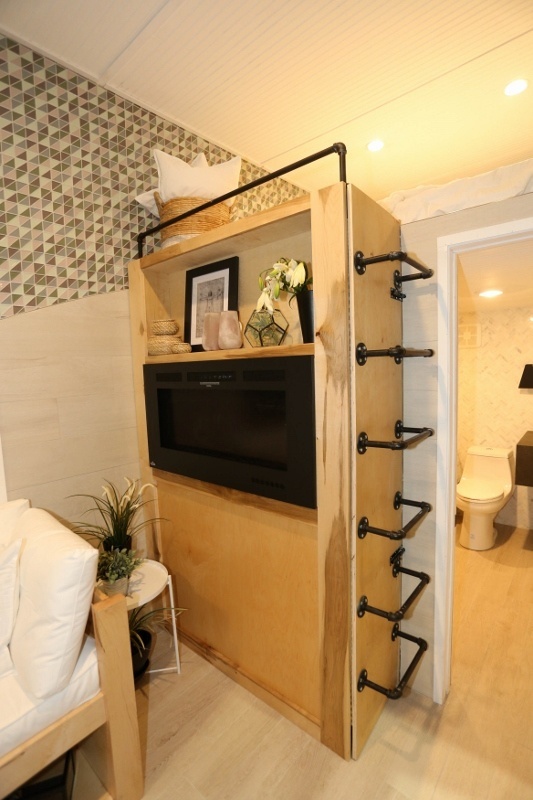 Storage is always at a premium in a tiny living space. For that reason, Nikki designed a custom daybed with a 28" custom mattress size so as not to take up too much of the common space. The Vitruvian includes one sleep loft and having this custom daybed rather than a couch provides for a second sleeping space. Note that the daybed includes storage underneath it. The door to the storage unit functions as the stairs to the sleeping loft. Note that, to climb the ladder, you need to make sure to secure the latches in place. 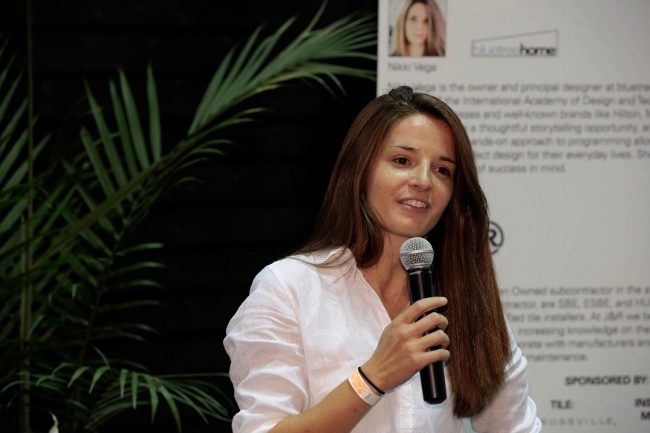 You can watch Nikki Vega as she takes you through the Vitruvian in this 4:05 minute video titled The Design Tourist at Coverings 2017, from Crossville Tile. 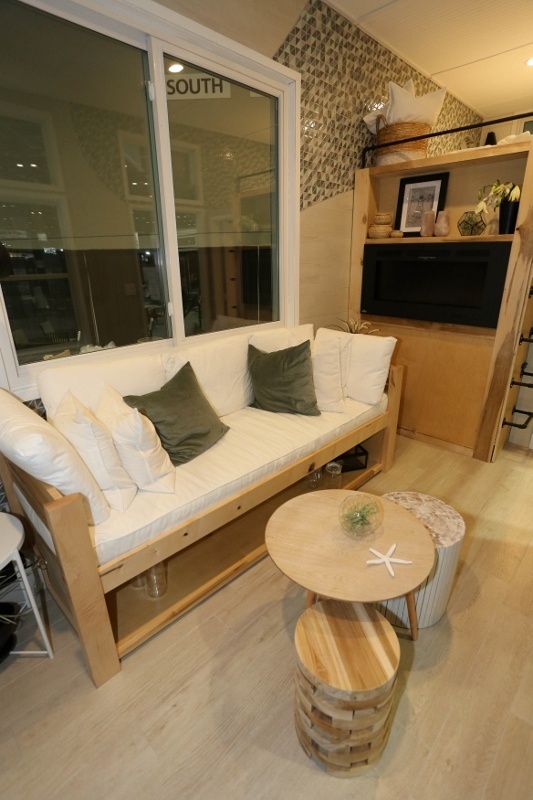 Did you get to see the Vitruvian Tiny House at Coverings17? What did you think of it and how the different kinds of tile - ceramic tile, glass tile, gauged tile - accentuated the design? 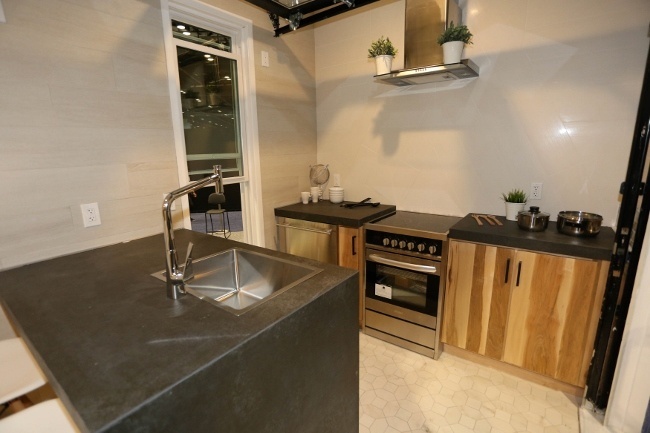 How might you use tile in a tiny home or space?